Flying the Flag at Luss! 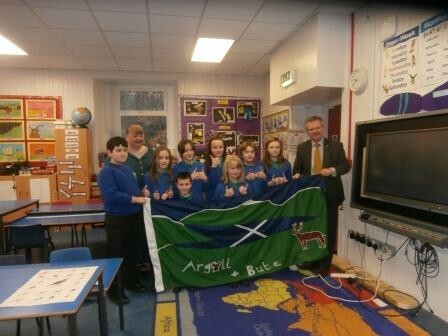 Luss Primary was visited recently by Argyll & Bute MP, Brendan O’Hara, who presented the children with their flag which they designed for the Westminster Flag project. The project marks the 750th anniversary of the Montfort Parliament, where elected representatives came together for the first time paving the way to the House of Commons we know today. 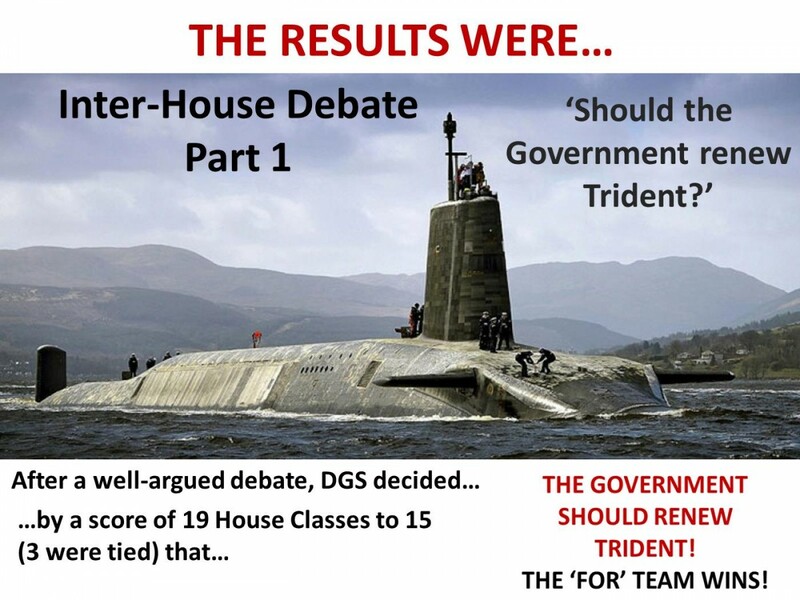 On Friday the 18th December, the pupils of Dunoon Grammar School took part in a whole school debate on ‘should the UK government renew Trident?’ This was the culmination of three weeks of preparation, research and speech writing for everyone involved. 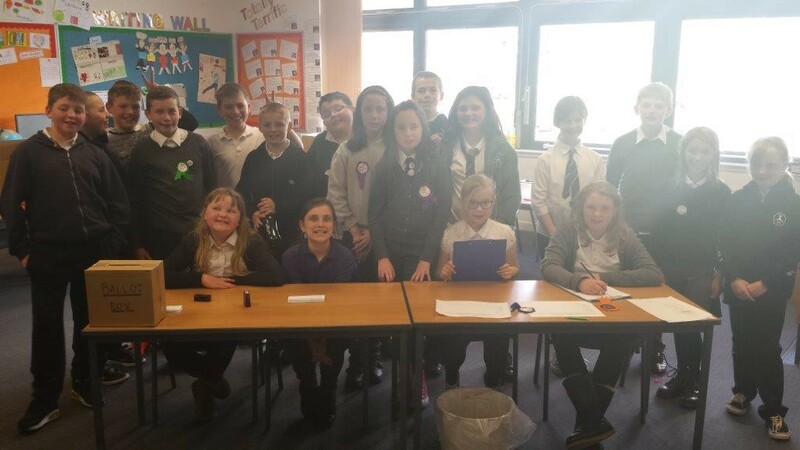 After last Terms IDL on the Scottish Parliament, where the children of Primary 7/6 researched how a democracy works and how elections are run, the children and staff of St. Mun’s went to the polls to cast their votes on who should represent the School for the session 2015/16. 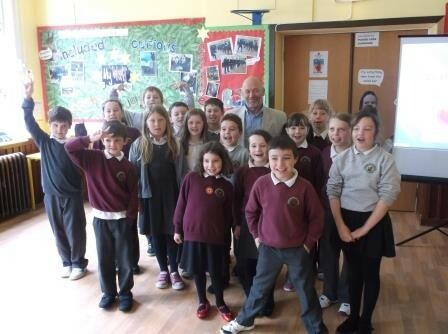 On Wednesday 17th of June, Tam Baillie – the Scottish Commissioner for Children and Young People – came to visit Strachur Primary School. Primary 4/5 asked him to come to our school because they have been doing a very interesting topic on the ‘Rights of The Child’ and learning about the United Nations Convention on the Rights of The Child (UNCRC). Rich World, Poor World at Tobermory High School. 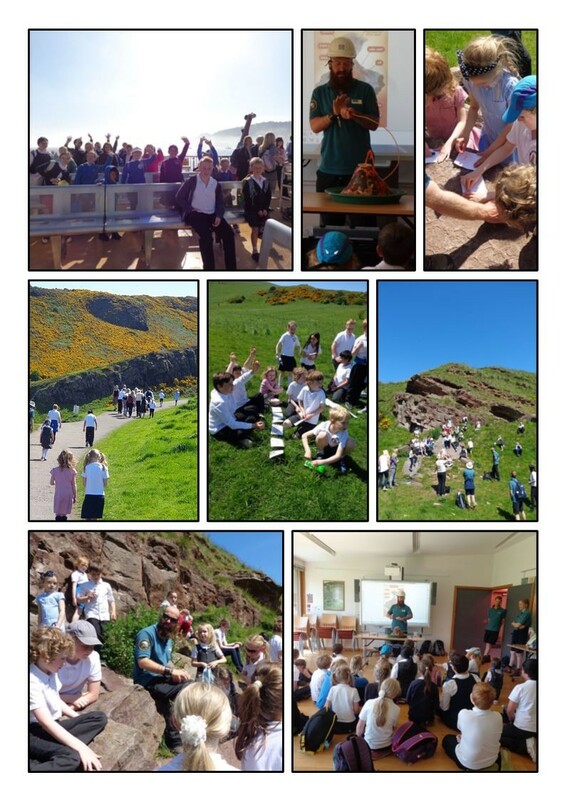 S1/2 spent the day considering the topic of”Rich World, Poor World” in their latest RME conference. 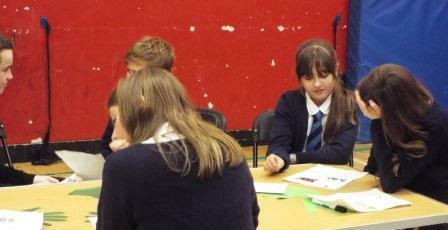 Over the morning they looked at some of the issues facing those in the world today. They started by dividing the world’s wealth between them (some had a lot more than others) and considered some of the factors which determine whether or not you have enough to eat. The group explored human rights and made a quilt to illustrate them . Paper chains were created to show what barriers there are for some and how these could be broken. 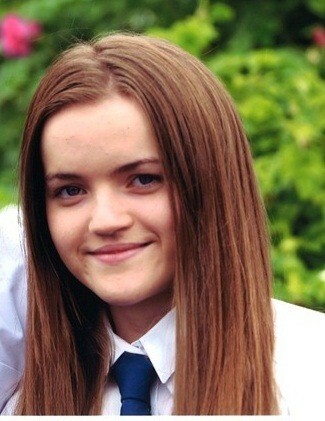 Following a competitive selection process, S6 Rothesay Academy School Captain, Marjorie Hogarth has gained a place on the prestigious Euroscola visit to Strasbourg and the European Parliament in March 2015. Marjorie will spend a week in Strasbourg and will have the opportunity to attend multilingual presentations in the parliament building alongside students from other European countries. In addition to attending debates, the students will have the opportunity to vote on European issues and gain a deeper insight into topical issues. For Marjorie who has been offered a place at university to study French this is a wonderful opportunity to develop her language skills and prepare for her future studies. 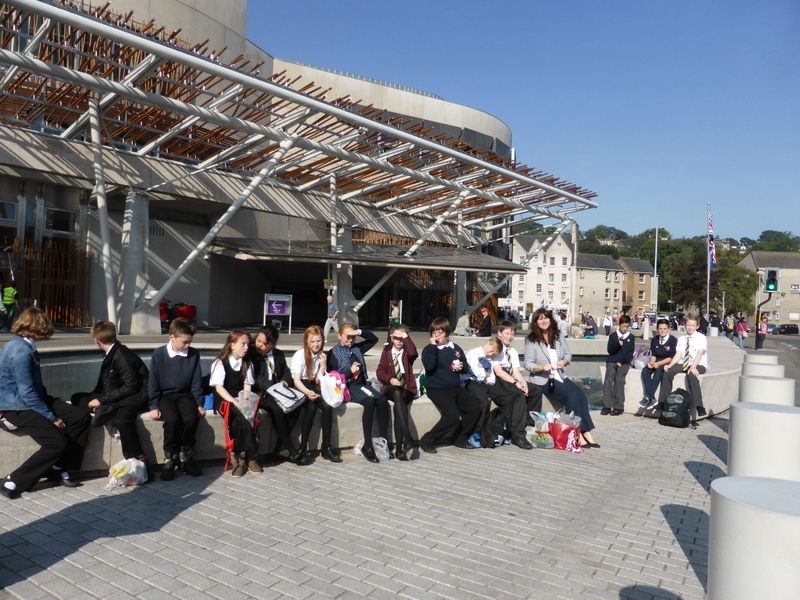 The Primary 6’s and 7’s from Dunoon Primary School along with the Primary 7’s from St Mun’s Primary School recently visited the Scottish Parliament in Edinburgh. 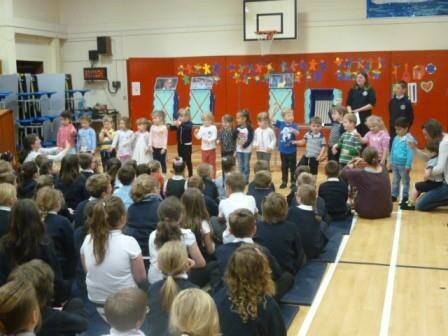 This followed visits to our school from the Outreach Workers from the Scottish Parliament. 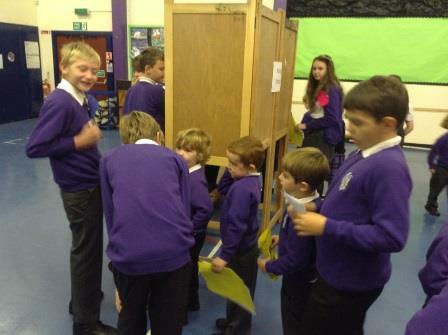 The children have been learning about Democracy in Scotland through their Interdisciplinary Study. They are learning about the benefits of living in a democratic society and how we should value and respect the views of others who may differ from our own. 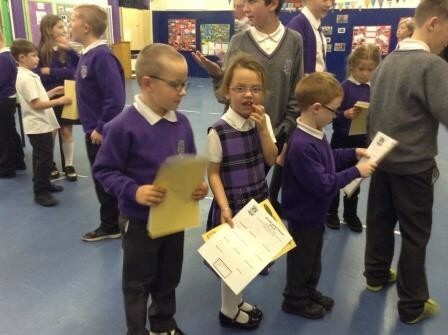 Monday 31 March 2014 saw P7 children of St Joseph’s welcome a very important visitor to their class, Ms Jackie Baillie, MSP. 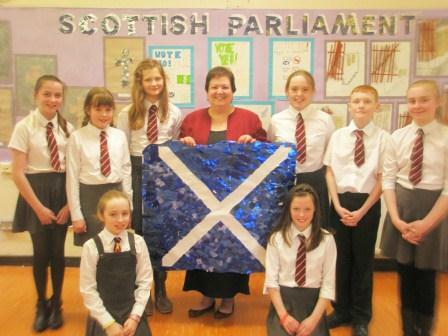 Jackie was there to bring a personal dimension to P7’s Interdisciplinary Learning Study, ‘The Scottish Parliament’. But if Jackie thought this was to be an easy question and answer session, she was to be surprised! 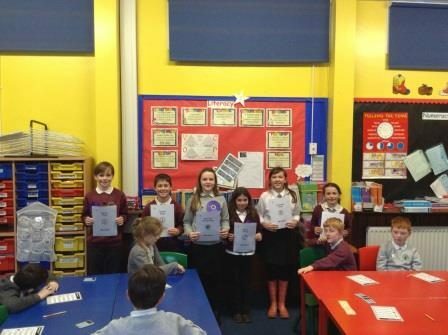 P7 asked several deep and searching questions and their teacher, Miss Claire Boyd, was delighted with how eloquently the children addressed their questions and how they also came back at Ms Baillie on her responses.